The ISS Transit Finder is a web application designed to aid planning the observations of lunar and solar transits of the largest artificial satellite of our planet, the International Space Station. It is designed to be intuitive and easy to understand even for non-astronomically inclined observers. This help page contains information about the features of this website and the interpretation of the prediction results. Observer location: your geographic coordinates and elevation. Latitude and longitude should be provided in a decimal form, positive for the northern and eastern hemispheres. For example, 40°30′ N and 80°15′ W corresponds to a decimal latitude (φ) and longitude (λ) of 40.5° and -80.25°, respectively. Elevation (h) should be in a range between -500 and 9000 meters with respect to the mean sea level. This information should be as precise as possible if you are looking for transit data exactly at a given point on Earth. If you are looking for predictions in the vicinity of your location, it can be approximate. Time span: The first and last day of the calculation period. Both dates are inclusive. Allowed range is 10 days into the past and 30 days into the future. Default is today to 20 days into the future. The start date must be equal to or earlier than the end date. Travel distance: The maximum distance from the selected coordinates to the center line of the transit's visibility path. Allowed range is 1 to 240 kilometers. Default is 80 kilometers. After the calculation is complete, you will see a list of events about to occur in a requested time period. In case there are no results, return to the main page and try to specify a broader range of dates and/or a larger travel radius. ISS angular size: the most important property, which determines how large will the station appear to the observer. Measured in arc seconds, or 1/3600ths of a degree. For comparison, the angular size of the Moon or Sun is usually between 1800-1900 arc seconds. The planet Venus can reach more than 60 arc seconds when it's close to Earth, comparable to the ISS size in optimal conditions. ISS distance: this value is inversely proportional to the angular size of the station. In rare cases, it can be as little as 390 kilometers. Angular separation: the apparent distance between the ISS and the center of the target object, in arc minutes, or 1/60ths of a degree. Azimuth: measured clockwise from north. 90° is due east, 180° is due south and so on. Altitude: 0° is at the horizon, 90° is straight up (at zenith). The altitude of the ISS is closely linked to its distance and apparent size, which means that the best transit events are visible high up in the sky. Center line distance: the geodesic distance to the nearest center line point. Visibility path width: the width of the transit visibility region on the surface of Earth. Very wide paths indicate that the event is occuring on a low altitude, which decreases the observational quality. Transit duration: the period of time during which the ISS will be visible directly in front of the target object. Only applicable to transits visible from the observer's location. 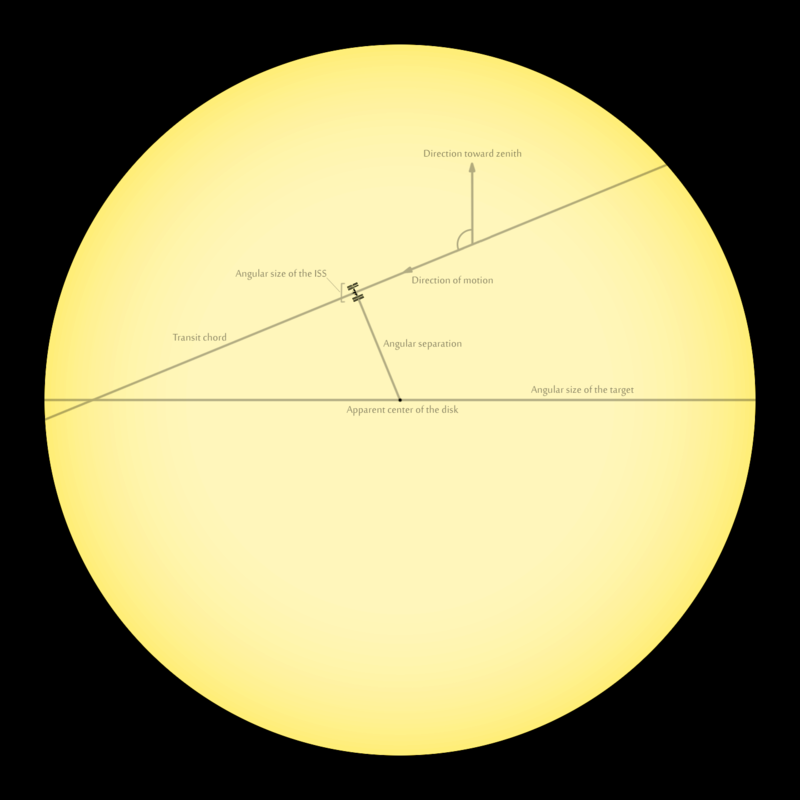 Transit chord length: the angular distance crossed by the ISS directly in front of the target object, in arc minutes. On the center line of a transit, this is equal to the target's angular diameter. Only applicable to transits visible from the observer's location. R.A. and Dec.: the celestial coordinates of the ISS at the time of the smallest angular separation. Parallactic angle: the angle of rotation between the celestial and azimuthal reference frame, measured counter-clockwise from the direction of the zenith. ISS velocity: Angular is interpreted as the apparent angle crossed by the station during one second, in arc minutes. Transverse is measured in a tangential direction to the observer. Radial indicates the speed at which the ISS is moving towards (negative) or away (position) from the observer. Following the Pythagorean theorem, the square of the total velocity is equal to the sum of squares of the radial and tangential velocity components. Direction of motion: the apparent direction on the sky in which the ISS is heading, measured counter-clockwise from zenith in the azimuthal reference frame. For example, when the station is moving horizontally from west to east, the calculated value is 90°. Moon/Sun angular size: the apparent diameter of the disk of the target object, in arc minutes. Moon phase: the percentage of illumination of the Moon. Only applicable to lunar events. Angular separation from Sun: the apparent distance between the Moon and Sun. 0° corresponds to a new Moon (0% phase), 90° is the first or last quarter (50% phase), whereas 180° is a full Moon (100% phase). Only applicable to lunar events. Sun altitude: a negative value indicates that the event occurs at night. Only applicable to lunar events. Illuminated/In shadow: whether the ISS will be visible as a bright source of light or a dark silhouette. Only applicable to lunar events, since the station is obviously always illuminated from the opposite side during solar transits, making it appear dark from the observer's point of view. It should be noted that the positional data (azimuth, altitude, celestial coordinates etc.) are calculated for the ISS, not for the target object, unless noted otherwise. All the values are valid for the observer's position and may be different across the visibility path. The illustration below provides a visual representation of some observational parameters. Click to enlarge. An additional piece of information is a small visualization of the apparent path of the ISS seen from the observer's location. It shows the brightness of the sky (blue or black background), the phase of the Moon (in case of lunar events) and the direction of the motion of the station in the horizontal reference frame. The path has a white color when the ISS is illuminated by the Sun. ★★★★: the angular diameter of the ISS is larger than 60″, or in a range of 45″-60″ and the travel distance is less than half the maximum. ★★★: the angular diameter of the ISS is in a range of 45″-60″ and the travel distance is more than half the maximum, or in a range of 30″-45″ and the travel distance is less than half the maximum. ★★: the angular diameter of the ISS is in a range of 30″-45″ and the travel distance is more than half the maximum, or smaller than 30″ and the travel distance is less than half the maximum. ★: the angular diameter of the ISS is smaller than 30″ and the travel distance is more than half the maximum. For lunar events occuring during the day, one star is subtracted when the event occurs at an angular distance of less than 90° from the Sun, and two stars are subtracted for a separation smaller than 30°. This rating is obviously highly subjective and may not be on par with your own judgment. The application includes a built-in map tool which comes in handy in pin-pointing the locations of potential observational spots. In order to display the map, either click the Show all on map button on top of the results page or one of the Show on map buttons visible in each of the event entries on the result list. Doing the former will automatically revert the map center and zoom position so that the entire travel circle is shown. The visibility paths of all calculated events will be displayed. You can also choose to show only lunar (blue) or solar (red) transits by clicking an appropriate option in the bottom of the map. Choosing Only selected will display the currently highlighted event, if there's one. This is also the automatic option when the map is displayed after one of the Show on map buttons is clicked. The top settings bar allows you to toggle the visibility of the center lines (where the ISS passes directly through the center of the target's object apparent disk), and the selected location along with its travel radius. Clicking anywhere on the map will display a small information box containing basic information about the selected location: its geographic coordinates, name and the geodesic distance from the observer. You can use the Recalculate for this location shortcut to quickly obtain information about upcoming transits for the selected coordinates. If the clicked location lies on one of currently visible paths, the information box will also contain a short summary of the selected event, as seen from the chosen point. While the positions of Solar System bodies can be determined with near-perfect accuracy for many centuries into the past and the future, the orbit of the International Space Station is constantly changing in an unpretictable manner due to semi-random factors such as the atmospheric drag. Because of this, accurate parameters of the transit events can only be reliably calculated for a short time into the future. Any predictions further than 10-14 days from today should be treated as a rough approximation - both the timing and the position of the event may change significantly. In a few hours directly before any event, the predicted time is known with a precision of a fraction of a second, while the position of the center line is usually accurate down to 100 meters, which is approximately one width of the ISS. Solar observing is dangerous. Never look at the Sun through any kind of optical instrument without an appropiate and reliable filtering, such as an ND5 mylar foil. Observing the Sun without eye protection will result in an instant, severe and irreparable damage or complete loss of your eyesight. Always inspect the surface of your filter for potential damage (such as punctures) before each observation. When using your telescope during the day, pay extreme caution not to accidentally point it at the Sun when the filter is not mounted.